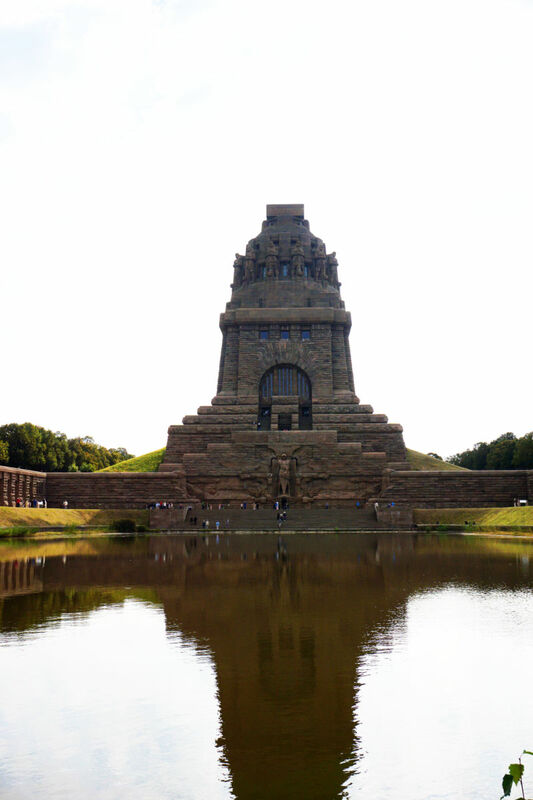 I had read a fair bit about the Monument to the Battle of the Nations in Leipzig. But once again I found evidence that reading and experiencing are two very different things. I would have loved to see my face as our hop on hop off bus stopped in front of the monument. The Monument to the Battle of the Nations commemorates the Battle of the Nations near Leipzig in which Napoleon suffered a great defeat between the 16th and the 19th of October 1813. Shortly after the battle first plans to erect a monument were made. A foundation stone was laid in 1863 but plans what exactly the monument should look like did not exist. Many attempts were made to find a satisfying design. 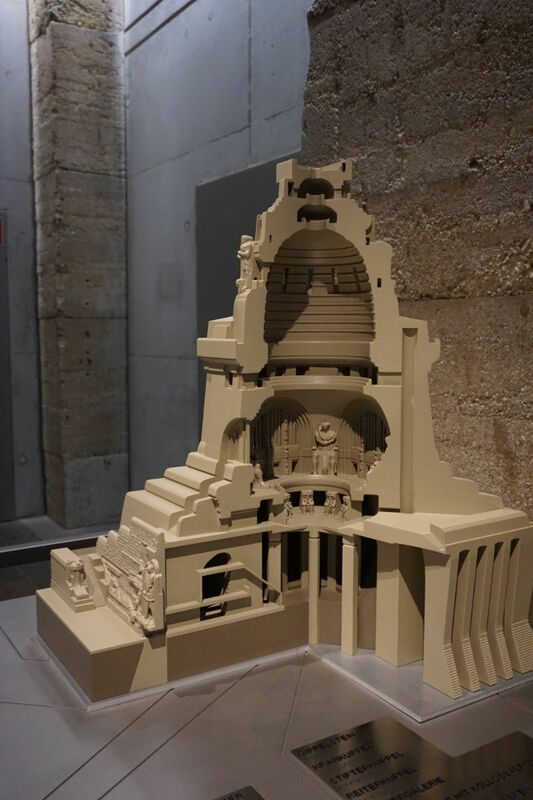 After time-consuming debates, an architect from Berlin, Bruno Schmitz, was commissioned to work out a design. A new foundation stone was laid on the 18th of October 1898 and after some years of construction, the monument was inaugurated on the 18th of October 1913. The funding of the endeavour was quite extraordinary. To top up the donations to finance the project, a special lottery was set up to attract even more funds. Elaborate restorations were completed in 2013. The hop on hop off bus stopped at the forecourt to the monument and the driver announced that the tour would continue in 15 minutes. A quick look at the monument was enough to determine that we would need more than 15 minutes to see everything. We wanted to get inside the monument and also on top of it and experience everything in our own time. In front of us was a monument, 91 meters high, that we did not expect to be that big. The forecourt alone with the giant water basin was bigger than two football fields I think. Like a dark colossus, the monument rose from the ground at the end of the courtyard. As we slowly approached the monument we began to see more details of the actual design. A giant sculpture of Archangel Michael, who is the patron of soldiers, stands at the entrance of the building. Beautiful reliefs decorate the front. It felt a little like the entrance to a temple. We entered the crypt first. It is a symbolic grave for all the fallen soldiers of the Battle of the Nations. Stone warriors line the sides of the room and watch the dead. A look up told us that we would have to climb a lot further up to reach the highest viewing platform of the monument. Part of the climb can be skipped with an elevator (maybe two-thirds of the way). We preferred to actually climb the 500 stairs of the spiralling staircases. 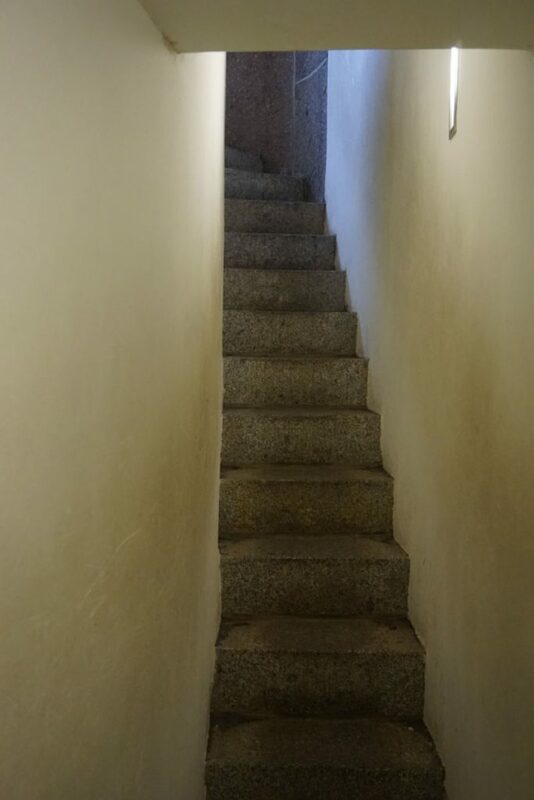 The further up we got, the narrower the staircases became. It is a very good solution that some of the highest staircases are for going up only whereas others are reserved only for the way down. In some spots, it would have been impossible to pass each other on the stairs. After two-thirds of the way, visitors reach the first viewing platform which really offers a stunning view already. So no one has to climb all the way up. But we continued the way up on the stairs. The highest viewing platform can only be reached by a staircase that just about has shoulder-width. Light signs regulate times for coming up and going down on it. Well, at least they should. When we visited, the red light was broken. Since there was no other sign that explained the regulations nobody bothered to wait. What an experience to run into other people on such a narrow staircase. But the view made the climb well worthwhile. 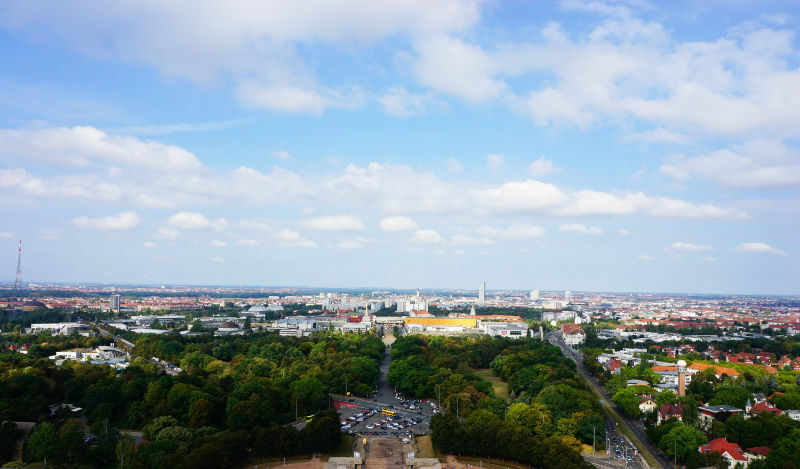 Seeing Leipzig like that is absolutely stunning. On the way down we stopped in the Hall of Fame. In it were four statues, each was nearly 10 meters high. They are symbols for the four German virtues during the Wars of Liberation – courage, strength of belief, power of the people, willingness to sacrifice. I was not able to fully see how they symbolise these values but the colossal size of the statues impressed me. Also very impressing was the dome of the Hall of Fame. 324 almost life-sized depictions of horsemen are painted on the dome but looking at them from all the way down in the hall they seem so small that their actual size is very hard to believe. For me, the visit to the Monument to the Battle of the Nations was well worthwhile. What an impressive building! I’m not sure. But I know that you can get a paper guide. My goodness, it looks a little clunkier than I’m used to seeing European monuments look, but I guess that’s because it’s more of a memorial, not something meant to be flashy. I’d love to see it in person, though – I imagine the sheer scale of it is incredibly impressive. Thanks for the writeup!! What an interesting and intriguing monument. 500 steps that would knacker me but the views are pretty cool from the top. 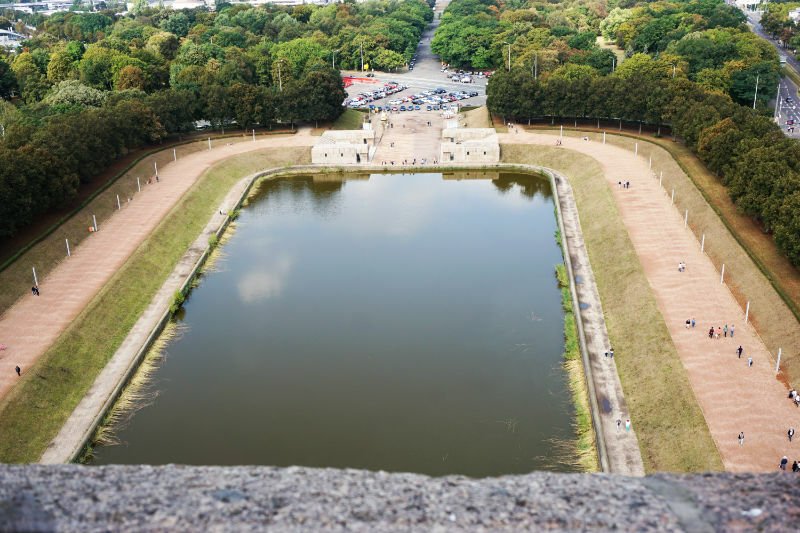 It is always interesting to hear about the history of such a grand monument and you are right reading about it and experience are very different. Also good to know that the hop on hop off bus goes there. Sounds like a very impressive monument! I think it’s so important to explore historical sites when travelling to learn a bit more about the country and culture. Were there audio guides available to learn a bit more while touring the monument? I love visiting historic places during my travels. How lucky that you got to experience this! I was just imagining how it must have been a little chaotic with the red light being out-of-order to direct traffic properly on the staircase. This sounds like a fun place to tour and the views are amazing. At first when I read you climbed the 500 steps, I was like wow that’s a lot (and it is..) but it’s nice that they break it up for you. I’ve done that before and it’s tiring! However, as usual, you are rewarded with gorgeous views!! Aren’t the “traffic lights” interesting? I was surprised the first time I ran into that, but it really helps unless it’s broken! I’m guessing you got up close and personal with the oncoming traffic! ;) Definitely would like to see the Monument to the Battle of the Nations! Sounds like a really cool monument to visit! I just got back from Germany myself and loved it. 500 steps though – must have been quite the climb! So happy someone has blogged about this epic monument! I have visited the monument to the battle of the nations twice and it did not fail to impress me!